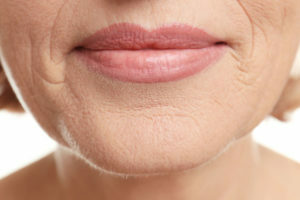 Having downturned corners of the mouth can often leave people looking permanently unhappy or angry; however, drooping of the sides of the mouth is a natural sign of ageing. As we get older our skin loses elastin and collagen, two proteins that help maintain a face’s youthful look. As a result, the skin loses its firmness and starts to sag. This forces the corners of the mouth to droop. This process can be accelerated by genetics, exposure to extreme climates and smoking. Another cause of droopiness is the contraction of the mandible muscle, known as the depressor anguli oris (DAO). Continued, repetitive use of the DAO can lead to a more permanent downturned mouth.